Coole Park is a nature reserve and one of the most beautiful areas in Ireland with a rich mix of natural beauty, a vibrant heritage history and a special area of unique environmental importance. We see however that with extreme weather events – all of these aspects of Coole Park are being very badly threatened. We need to ensure that Coole Park is well protected by the emerging South Galway Flood Relief scheme. In 1768 Robert Gregory, Chairman of the East India Company, bought 600 acres from Oliver Martyn of Tulira and this became the foundation of Coole Park as we know it today. In 1770 he built Coole house and also started the construction of a Walled Garden in 1775. In 1776, it is reported in ‘A Tour of Ireland’ that many miles of walls are being constructed and also that “Mr Gregory has a very noble nursery, from which he is making plantations, which will soon be of great ornament to the country”. As part of the Walled Garden, beech trees and a line of Yew trees are planted. Richard Gregory continued the work and also had a bust of Maecenas transported from Italy. Coole Park is famous for its Autograph Tree and Lady Gregory (Wife of Robert Gregory’s great grandson) also had a fondness for the Yew and in ‘Gods and Fighting Man’, called it ‘the most beautiful of the wood’. There are very frequent reference to the line of Yew trees in visitor reports to Coole House. Even in the Ordinance Survey 1838 maps we see an outline of the walled garden with the paths, pumps and the line of ‘evergreen’ trees where the current Yews stand. And until recently this is what the Walled Garden looked with the line of yew trees in the centre and the Autograph tree on the left. These yew trees (Taxus baccata) have become a distinct feature of Coole Park and can reach 400 to 600 years of age and beyond. Coole-Park/Garryland is therefore one of the most specially protected areas in Ireland with significant ecological benefit. It is operated by the Irish National Parks & Wildlife Service (NPWS) who are part of the Department of Arts, Heritage and the Gaeltacht, currently under Minister Josepha Madigan T.D. It is their responsibility to ensure that Coole Park (and other Turlough areas) are protected. Coole Park is now under significant threat from several flooding events and we need to ensure that those that are responsible for its protection are made aware of their responsibilities and do their jobs. Several times in the past 30 years Coole Park has experienced severe flooding – in fact some of the worst flooding in several hundred years. While local people experienced the worst flooding seen in the area in their lifetime – Coole park was subject to an even starker picture – that of experiencing the worst flooding in centuries – many of the famous Yew trees that have been around for and estimated 220 years were destroyed by the flooding in Winter 2016 and water was very close to the autograph tree. In the past 30 years, we have had a large set of hydrology changes in the South Galway / Kinvara Catchment. The Slieve Aughty mountains now have significant developments around forestry and windfarms (with their corresponding roads and drains). Uplands farming improvements have resulted in land being drained more than in times past. In the Slieve Aughty lowlands there have been rivers streamlined, new culverts installed and inadvertently, some swallow-holes damaged and overflow channels obstructed through land reclamation. Whatever the reason for hydrology changes the consequence is that Coole Park has become the defacto dumping ground and holding site for enormous amounts of contaminated flood water in South Galway. This flood water includes pollutants and contaminents from septic tanks, farmyard slurry tanks and farmyard pollutants as well as farmland run-off and significant amounts of silting. This not only has severe consequences for the environment and human health but it also drastically affects the overall community as the water levels threaten homes, businesses, churches and severely restricts access around several communities in South Galway. As Coole lake has unfortunately become the dumping ground for run-off water from the Slieve Aughty mountains – there are many significant consequences. These Yew trees had survived over 220 years and it shows that the levels of recent flooding allowed in Coole Park are record levels. Also, it wasn’t just these Yew trees. A large Yew tree at the Walled Garden car park was damaged, and an copse of Yew trees in Garryland was also severely damaged as well as several Yew tree near Newtown. Coole Park is a Special Area of conservation (SAC) and Yew Tree (Taxus Baccus) woodlands are called out specifically in this. We are therefore failing in adequate protection of this SAC. A farm shed in Glenbrack completely immersed in flood water – Water levels should not be allowed to rise to these levels! Several farm yards around the area are 13m above sea level. In 2015, Coole Lake rose to 14.78m, and it overflowed into many farmyards, homes and businesses. Common farmyard pollutants can include chemical fertiliser, engine oil, grease, fuel, silage wrap, weed killer, pesticides, veterinary medicine etc. Also at this stage the contents of over 40 septic tanks were being washed into Coole lake. In many places, there were black plastic silage wrap spread through trees and shrubs all over the park. With extremely high-level allowed in Coole, this pollution will also be spread into the lower-lying turloughs and SACs. With extreme levels of flooding in Coole, this habitat is lost and the bat population displaced – something which grates against the EU habitats directive. As the water leves of Coole Lake rose, the rivers feeding it lost pressure and this resulted in significant amount of silt deposits. This has a big impact on the natural ecosystem, marine life as well as impacting hydrology of the system. TThe main damage to Coole Park amenities was around the walled Garden and picnic area. Also the little hut beside the river had its roof lifed too and damaged. The Coole Park Interpretative centre was became flooded. In 2015, there was as estimated €20,000 of damage done around Coole Park amenities – There is also a potential knock-on impact to tourism. Coole Lake provides a significant amount of attenuation for South Galway, however when it is allowed to reach the levels it did in 2015 is has a huge impact across multiple communities. On a normal Summer, Kiltartan Church is 2 KM away from Coole Park and the lake levels can be just 5m above sea level (AOD) . The door step at Kiltartan Church is 14.52m Above sea level (AOD) . In Winter 2015, the level of Coole lake was 18 inches into Kiltartan Church. Similarly Tierneevin is 2km from Coole lake in the summer and Coole lake backed up into this area as well. this flooding homes, septic tanks, farmyards, this is what happens if the maximum level of Coole Lake is not maintained. Coole Lake also flooded homes and businesses in Raheen, Crannagh, Glenbrack and Tierneevin. According to McCormick/Naughton (GSI/Trinity) , the levels of water in the groundwater system can influenced flow rates in a Karst system. and highlights examples where the backwater effect of flooding at the downstream sink reduces the hydraulic gradient and increases upstream river levels. High Coole lake levels mean a drop in pressure upstream causing more water to gather. Swallow holes almost completely stop working in Kiltartan, Roo and Tierneevin as Coole Lake level back into them and some of the other flows are impacted – even as far back as Ballylee and Blackrock. It also flooded the M18 motorway construction for several weeks. There is a significant threat to human health from this flooding scenario. The mental stress and anguish of having your home or livelihood threatened is enormous. Also many people were affected the severe isolation – not being able to leave your home conveniently. The threat to physical health by contaminated water and health schemes is significant and private wells can continue to be contaminated long after flood water recedes. As Coole Lake rose, it covered a large amount of farmland and stayed on the land . Many farms in the area had to be reseeded at a significant cost to the farmer. As with wildlife, another significant threat is that to farm animals and threat to their health from contaminated flood water. Coole Park is a very attractive destination in the west of Ireland. Trip Advisor shows it as the #1 attraction with 4.5/5 star reviews. 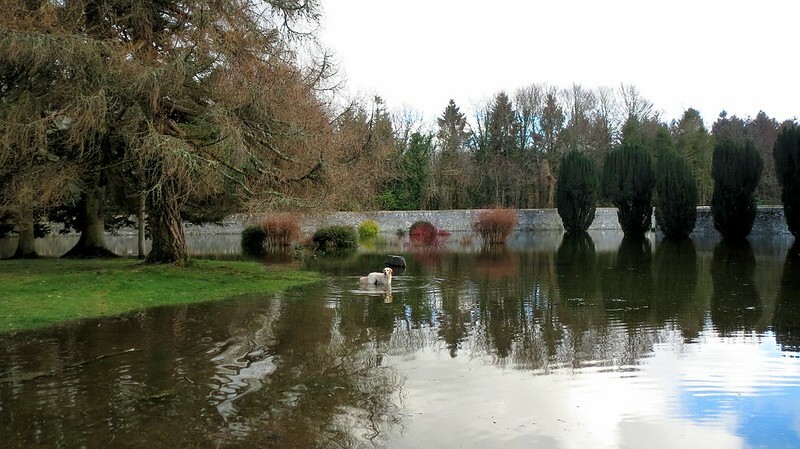 Allowing Coole Park to flood increases the risk of damage to the park, the infrastructure, the trees and the wildlife and therefore also to the Tourist potential of the area. The following infographic gives a summary of the situation. Info is compiled from OPW recorded levels and GPS aided levels. Here are a number of facts. Coole Lake can rise to levels of 11m without any major flood threat, which is still an 8m (26ft) difference from low summer levels. Once Coole Lake level rises above 12m, road access is impacted and farmyards are threatened. Once Coole Lake level rises above 13m, septic tanks and farmyards start to flood and homes are threatened. Once Coole Lake level above 14m, the underground systems (Kiltartan, Tierneevin and Roo) are no longer working and homes start to flood. Solving the flooding in Coole Park is a not a choice – it’s mandatory. Coole Park is one of the most protected areas in Ireland and allowing severe flooding is devastating to the nature reserve, several communities and in fact against EU law. The organisation accountable for Coole Park nature reserve and owns the responsibility for ensuring this is adequately protected against threats (including flooding ) is the National Parks and Wildlife service – NPWS. We have the best possible chance at getting a right solution here as the South Galway/Gort Lowlands Flood Relief Scheme gets underway. Galway County council is running the project, we now have design consultants, environmental consultants working toward getting a solution. The South Galway Flood Relief Committee has had several meetings over the past 2 years with Dr Mooney to try and demystify the situation that will enable flood relief solutions to progress seamless so that the South Galway Community gets its flood relief solution and that also keep to the letter of EU legislation. We’ve made some great progress on certain aspects and there some very good collaboration here and overall I feel that the NPWS has stepped up the plate. However, there are still some areas of concern that need to be smoothed out and these will be outlined in the next article which will go into a bit more detail on these issues. Coole Park was developed by the Gregory’s for hundreds of years and has become a magnificant nature park, with strong cultural and heritage ties. It was left in the care of the Government in 1927 and taken over by the Forest Service and since 1987 it is now in the care of the NPWS. They now have a key reponsibility here to be part of the solution and help and advise the consultants to get a full flood relief solution that will help the South Galway Community and halt the killing of Coole. In the meantime if you feel strongly about helping to save Coole Park from future serious flooding and in addition to helping the many people affected by flooding in South Galway – please share this with as many people as you can. Please comment and leave feedback because it’s our collective voice that can have an impact here. Coole is one of the places we always try to visit when we travel to Ireland. It is a national treasure. Hiking in the woods at Coole and at Garryland is so special. Thank you for this article. Best wishes for getting the attention necessary to resolve this problem. I will share. Beautiful Coole Park is a regular walking outing with my dog, we sit and reflect together beside the turlough …..it is depressing to think of this place so rich in history being destroyed and contaminated. Thank you for giving a broader perspective on the effects of flooding and remind us that we often forget what we have until it is gone. Thank you for the huge amount of your time and energy and clarity you have given to this issue and for being a strong voice on behalf of so many. Well done, Mike.